First let me start by saying that I am not a seamstress. The only stitch I know how to do on a sewing machine is a straight stitch and I don’t know anything about pattern making. But, when I was a kid I used to make a ton of doll clothes. If you know how to sew and have ever made doll clothes, making baby clothes isn’t too hard. Also, keep in mind that this is the only time when your child doesn’t care about what she is wearing, so it may be your only time to experiment with making clothes for her. First, take a sweater or a jacket that fits your baby and use it to measure your pattern. Draw shapes for the sleeves, back and front two panels on the corduroy, then use those pieces to trace the exact same shapes onto your lining fabric. Don’t forget to leave about a half inch on all sides for the seams. Draw two birds from your liner fabric. Cut all your pieces out. Next, use fusible webbing to adhere the birds to the two front panels. To learn how to appliqué using fusible webbing you can refer to my tutorial on making Onesies here. After the bird is adhered, stitch the edges on using embroidery floss. 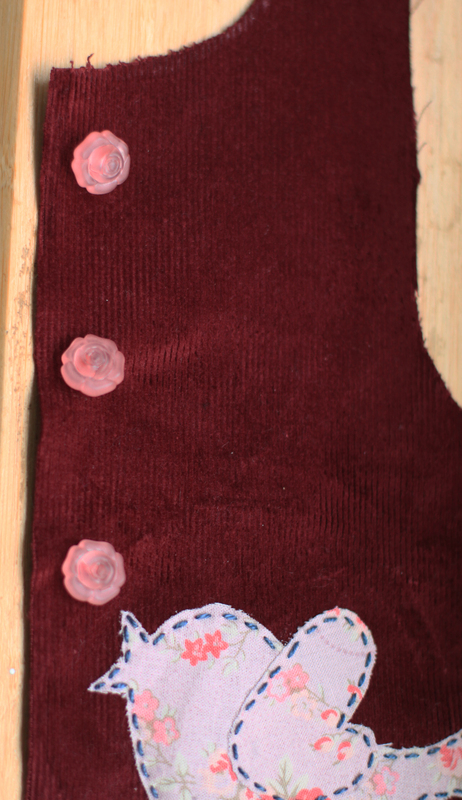 Then, before you start sewing the panels together, sew the buttons onto the left panel. Now sew all the edges that will be finished edges together by facing the lining fabric to the corduroy and sewing inside out. I don’t know how to sew button holes so I worked around it by using cord elastic for button closures. Sew the elastic into your stitch for the right front panel (shown in the pictures). Once you have all the finished edges sewn you can start to sew the panels together. I find that it is easiest to sew the sleeves in if you sew the pieces together in this order: Sew only the top of the back and front panels together. Now sew the sleeve to the back panel, then to the front. Repeat on the other side. Then sew the seam that runs up the sleeve and then sew the side seam on both sides. And you are done!